As you may have noticed, articles on this blog have been appearing a little less frequently than before. I have decided to drop down to only two posts per week, rather than three. New articles will now be appearing every Tuesday and Friday. I have some ongoing family issues that take a lot of my time, and this seemed like a good way to ease the pressure without just totally dropping the blog altogether. That being said, on to the links! Volpin Props has a step-by-step guide up for his latest prop creation, a Magister’s staff from the Dragon Age video game. I’ve been following the progress of this piece on his Twitter and Facebook, and it’s great to see the whole thing finally come together. And, it’s a nice introduction to matrix molding. I don’t know the source of this, but this video showing the inner workings of animatronic heads recently surfaced on the Internet. I find it fascinating to see all the mechanisms and bits that go on the inside, and how it all comes to life when the skin goes on top. This comes from last July, but I never actually posted it: Ten Props that Have Been Used in More than One Movie. One day, I want to do this for my own shows, because some props in my stock seem to be trotted out for every other production. Do you need a “Do Not Disturb” sign for your show? How about 8700 of them? Collector’s Weekly looks at the “Do Not Disturb” collection of Edoardo Flores, who has accumulated that many from hotels around the world. We start off today with this look at making a mold of a Zoidberg mask. These techniques are way above my pay-grade, but it is interesting to see such expert work done on a mold. This is actually the 9th installment of an ongoing series dedicated to creating a mask of the eponymous Futurama character, so check out the other parts if you want to see how it was sculpted and designed. Set designer Anna Louizos has grown tired of seeing set models, set decoration and props ending up in the dumpster after a show closes, so she has begun a website selling them off to collectors. Check out this news story on how she got started, then head on over to the web site itself. Collecting theatre memorabilia is not nearly as wide-spread as collecting movie memorabilia, but hopefully this site makes it more common. This sounds like it could be a nightmare: your theatre company wants to use the scene/prop shop as a performing space for one of their shows. Check out this video as Paddy Duggin, a carpenter and prop maker at the State Theatre Company in Australia, explains how they did exactly that for an upcoming production of The Seagull. And finally, we have the movies, where if you need a plane, you just build a plane. Find out why the production designer for Non-Stop needed to build a plane from scratch rather than re-purposing an existing one. “By accident I was a witness once of the manner in which a property man adds a coveted object to his collection. Our show was playing at Richmond, Va., at the time. Among the ‘props’ furnished by the theatre’s property man was a handsome rifle, which he had borrowed from a local firearms firm for the week. “‘You seem to be a pretty nice gun,’ he said, holding the rifle up to his shoulder and running his eye critically along the sights. “‘Ever been on the road?‘ he continued, carefully scrutinizing the stock of the weapon. “‘How would you like to go on the road?‘ he queried, as if he had a sudden inspiration. Originally published in The New York Times, July 24, 1904. Earlier this week, I headed down past Raleigh to tour the amazing film prop collection of Wesley Cannon. I first read about him in an article in the Raleigh News Observer; I realized it was only a few hours away, so I couldn’t pass up a chance to see some well-known props right in my own backyard. Wesley has been collecting props, costumes and puppets/animatronics for about a dozen years. 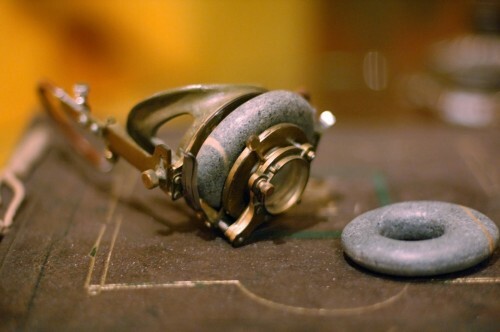 In that time he has amassed a truly remarkable assortment of well-known (and some not-so-well-known) objects and items. 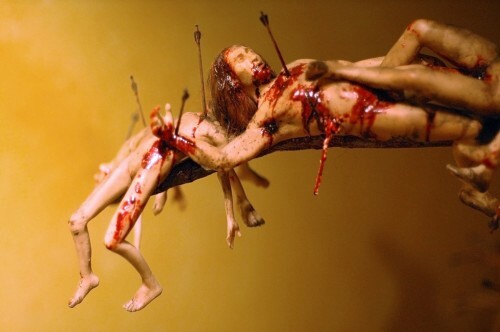 In fact, some of his better pieces are currently on loan to several museums around the world. 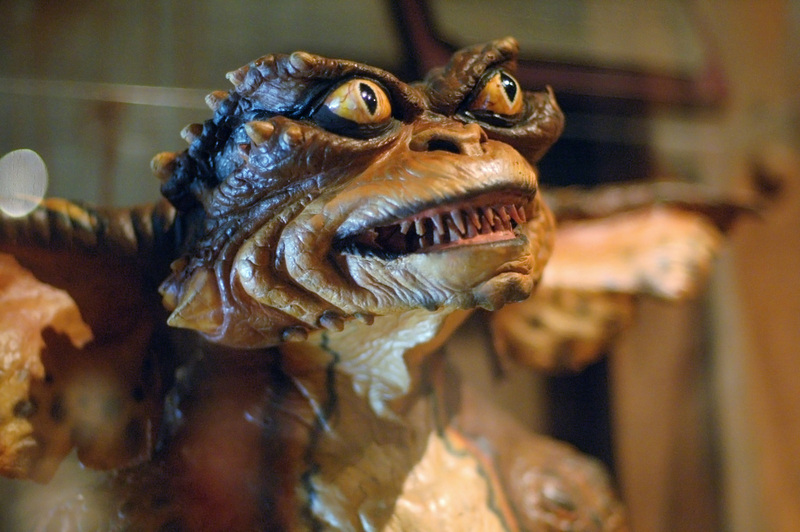 One of the Gremlin puppets from the 1984 film. Besides what I have pictured here, he had a Mandrake root and several wands from the Harry Potter films, two pods from the 1978 Invasion of the Body Snatchers, many costumes from Silent Hill, even more costumes and props from Thirteen Ghosts, Wolverine’s claws, Samuel Jackson’s lightsaber from Star Wars, one of Jason’s masks from Friday the 13th, one of Freddy Krueger’s sweaters from A Nightmare on Elm Street, a monster from Feast, Jennifer Lopez’s costume from The Cell, a goblin sword from Labyrinth, lots of figures from The Nightmare Before Christmas and James and the Giant Peach, and so many other pieces from films that would take too long to list here. A "seeing stone" eye glass from the film "The Spiderwick Chronicles". Wesley has a bunch of mannequin displays of characters from several films. What is truly amazing about these is that they combine the latex prosthetics and makeup appliances, the costumes, and some of the hand props. These elements are not just made by different people, but in many cases by completely different shops and companies, so after the film, they often scatter back to their points of origin. It makes it especially remarkable that Wesley was able to track down and reassemble so many disparate parts back into what they looked like on film. 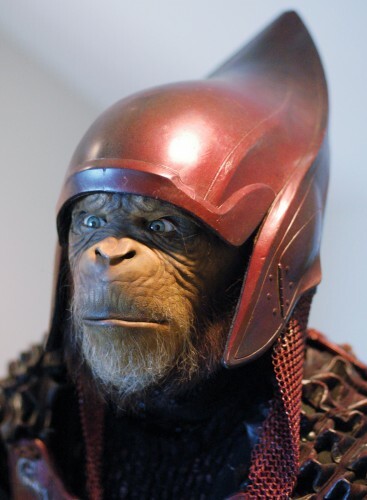 Bodysuit and helmet from the 2001 "Planet of the Apes"
The room itself was customized by Tom Spina Designs; they also repaired and refurbished some of the older props which had fallen into disrepair. You can see a lot of photographs of the displays they created as well as some process shots of them working on the room. One branch from the Tree of Death from the film "300". There is an episode of Hollywood Treasure in which they visit Wesley’s collection on YouTube (for now). Wesley also runs a company called Hollywood History in which he sells movie props, costumes and other memorabilia. He was interviewed about his company by Dan Benton of the Prop Blog a few years ago. Happy Spring everyone! I’d like to say that in the week since I’ve returned from USITT, I’ve found time to write even with tech rehearsals for the new Tony Kushner play and prepping for rehearsals of Shakespeare in the Park, but I haven’t. To paraphrase a great quote I heard in Charlotte, I’ve been busy making fake houses for fake people. Nonetheless, I have some links for you to spend your time reading and filling your head. With knowledge. The Restraints Blog is a whole blog dedicated to historical means of restraints, such as handcuffs, padlocks and the like. Last month, Popular Woodworking ran an important article entitled, “How Not to Hurt Yourself on a Table Saw“. It was the culmination of a series of posts looking at recently released data on the number of table saw injuries in the US (also worth reading). It is a good read for anyone who uses a table saw, beginners and seasoned pros alike. Toolmonger asked the question, “What’s the best book for a N00b machinist?” The readers’ comments are filled with a number of great book (and video) suggestions for getting started in using machine tools for shaping and milling metal. 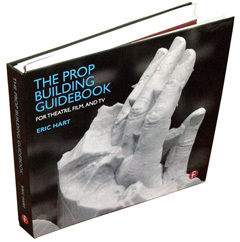 The Prop Blog features a number of auctions of screen-used film props. Though I do not talk about buying and collecting props on my site, I do love the pictures at The Prop Blog; quality photographs of cinema props can be hard to find, but this site has them in spades!